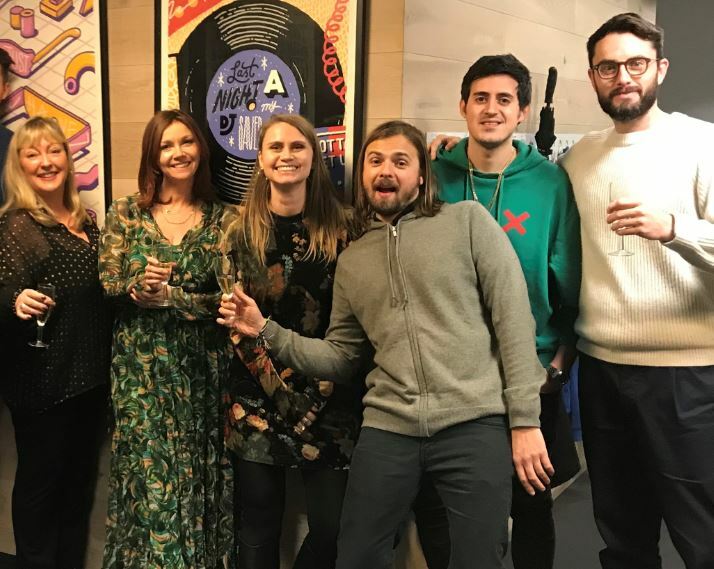 Sony/ATV has inked a new deal with the redoubtable, Ivor-winning tunesmith Cathy Dennis, who's penned or co-penned such monsters as the Grammy-winning "Toxic" (a commercial and creative peak for Britney Spears), "I Kissed a Girl" (a Grammy-nominated, international #1 for Katy Perry) and "Can't Get You Out of My Head" (a career high for Kylie Minogue), not to mention hits for Christina Aguilera, Celine Dion, David Guetta, Janet Jackson, Little Mix, P!nk, Mark Ronson, the Spice Girls and her own brief but glittering tenure as a pop artist. She's won no fewer than six Ivors, the most by any female songwriter. To celebrate this milestone, the following people got silly on champagne and subjected Dennis to what later became the Lifetime original movie My Karaoke Ordeal: SATV SVP A&R/Catalogue Fran Malyan, Dennis, SATV VP Marketing, Digital and Catalogue Promotion, U.K. Lettice Summerscale, Head of A&R U.K. David Ventura, Senior A&R Manager Alex Sparks and Senior Biz & Commerical Affairs Manager Andrew Spence. "Cathy Dennis was first signed to this company in 1989 when her debut single was released," Malyan commented, "so we are very excited that we have not only renewed our existing deal with Cathy but we will look after other songs in her catalogue for the first time. This includes new songs that mark a real return to form and will enhance her reputation as one of the UK’s best songwriters. Hey, who unplugged the karaoke machine?"